Traditional climbing is seductive. Sometimes I try to end the affair, but am oftentimes won over by the allure and addictive experience that is climbing. Some days I question my myriad of reasons for staying in this relationship. Most adventures leave me with bloodstained hands from failed attempts at cracks, neck cramps from arduous hours of belaying and a fatigued body. These seemingly painful aches are simple reminders of my mortality. A mere mortal, I crave experiences that enable me to be a part of something infinitely greater than myself. Many would agree that climbing is one of those experiences. Many would also agree that those existential experiences are made possible by certain man-made items. My personal favorite, the artificial thing with whom I feel most intimately connected, are my Katanas. 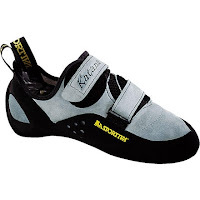 She is baby blue, made by La Sportiva and has a narrow fit. Some says she is simply a climbing shoe. I disagree. 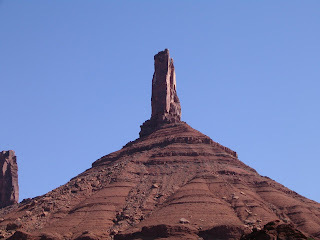 During a recent trip to Moab, I decided to climb Castleton Tower. With the necessary help of my partner, my katana’s and my determined desire to dance on sandstone rocks, we climbed the North Chimney. I diligently followed my partner, removing each cam and nut, judiciously placing my feet on sandstone chips. By the end of the third pitch, I fully understood why most people have a love-hate relationship with off-widths. There is something enticing about being suffocated between two rocks. My back against one wall and both my feet anchored onto the other wall, I slowly crept to the finish of my first off-width. Yes, my body hated me. My legs were shaking with excitement and fear, knowing that at any moment either one of my feet could lose their steady grasp on the slippery sandstone. At that moment, I had little choice other than to trust. A trusting relationship had already been established with my partner, but somehow this relationship with my feet seemed less reliable. I would do my best and put my faith in this process. My faith persevered and we summited. I reached the top, my shoes stained with sandstone, my hands covered in chalk, every muscle fiber throbbing and a smile on my face. This is why I climb. Few other activities evoke the sort of emotional vitality found in traditional climbing. Inevitably I find myself wondering how an old petzel harness and a pair of sweaty climbing shoes can save me from the depths of a mountain tower. More importantly, I wonder how I so willingly entrust my life to these seemingly generic items. After all, they are just pieces of climbing gear. The better part of me knows the truth. My Katana shoes, my harness, even my rusty belay device given to me by an old boyfriend, enable me to feed my addiction. They have earned my trust. They are reliable. And they enable me to freely experience the authentic thing we call life. I call it climbing. We all need help sometimes and when I needed to know how to make methamphetamine. I knew there was somewhere I could turn.